Ethernet to Serial Servers / Converters are specifically designed to allow industrial devices to be directly accessible from the network. Legacy devices are transformed into Ethernet devices, which can be monitored and controlled from any network location or even the Internet. Ethernet SertialDevice Servesr make your Serial Devices Ethernet ready! 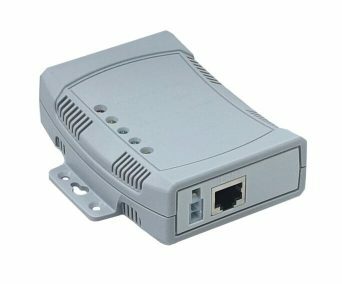 Such adapters connect to classic devices via at least one serial port, and allow to control this device via a network. The network is typically Ethernet, sometimes also WLAN and even control via Internet is possible. The remote control is in various ways, on the basic level via direct network programming in the control software. But most adapters come with a Driver or Com Port Redirector, by which the remote serial port appears as a virtual Com Port installed in the computer. Some other adapters instead provide a conversion of protocols like Modbus/TCP to Modbus/RTU. The NetCom Plus Serial Device Server family now offers the remote control not only on a local network, a special option allows for secure but simple to use Remote Access via Internet. This option uses the system of viaVPN. We accept Amex, Mastercard and Visa via a secure server site. | Free delivery in the UK. Export from £7.50. See here for more details. | UK same day delivery available. Call for a quotation. For quantity orders quotes or trading accounts please use our submission form. Terms & Conditions | Cookies are used by this website for security reasons only.